If you look at enough nomograms, you'll soon see some that have a pair of straight scales and a sort of curved scale in the middle. There are some "standard" nomograms that do this - see Winchell's page http://www.projectrho.com/nomogram/standardForms.html and scroll down to "GENUS I" to see a couple. The thing is, cover a pretty broad class of possible functions, especially when you start playing around putting inverses of functions in the determinant and playing around with transformations, and them mutliplying around. But if you look carefully at some of the curved scales in some of the old diagrams, the curves sometimes look a bit "rough". You can do this by hand (though a computer can certainly help) [i]without[/i] having your determinant, just your equation. Let's say you think you have a good candidate for this kind of graph. You might need to transform the variables (the nearer you can get to a standard form with three straight lines - like parallel scales or N chart or whatever, the better). So if possible play around a bit until you have a transformation where you could nearly use a parallel scale chart or an N chart or whatever, and you'd get reasonably close answers. Anyway, lets say you are satisfied that it's worth trying. Set up your two straight scales (I'm going to pretend that they're parallel for this exercise, and I'm going to call them Y and Z), with values. Now, pick your tick-mark scale values for the curved axis (which I will call W). For each tick-mark value on the W scale (even if you won't write that number on the scale), find a set of values of the other two variables that correspond to this value. Find 3 (or more) combinations of values, preferably over a wide range of the other two variables as will yield this result. You must have at least 2 (Y,Z) combinations for each value of W.
For a given W, draw in the Y-Z lines. If you have two they will meet at a point. If you have 3 you will probably get a tiny triangle. This is okay. If they all meet at a single point, great, mark a cross there (you should mark in the value of W unless it's otherwise going to be obvious to you). If you get a tiny triangle, choose an interior point near the centroid, but you may choose to bias it more toward the Y-Z combinations you need the most accuracy for. If you have more than three lines you'll have a region of little crossing lines with tiny quadrilaterals and triangles - you have to choose a "typical" spot as near the lines as you can get, remembering that the further you get from any one line, the less accuracy you have at that combination. After you have marked in all your selected values of W, you will have a series of small crosses with known values of W. Draw a smooth curve through them, put in your tick marks and the labelled values. Check it carefully, because this is seat of the pants stuff. 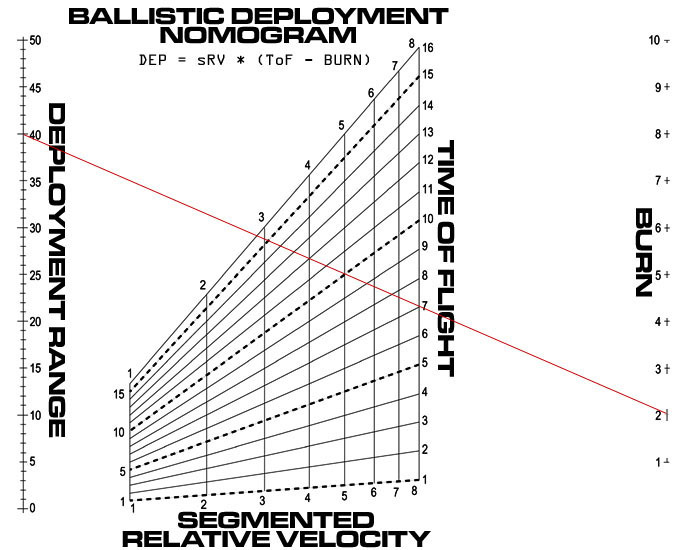 Voila - a nomogram without a determinant. In another post, I will write about taking an approximate nomogram like this that's working pretty well, and making it just that tiny bit more accurate. If I understand correctly, this is close to a term "rectification of curves" that is discussed e.g. in Ref. [p. 180, Levens, 2nd Ed, 1965]. The question is how one can make log(f(x))-log(g(y)) plots where all curves g(z)=const are straight lines. Sometimes this does not work out and result is that one does not try to find a intersection but a tangent as in Fig. 153 in Ref. above. where f1,f2 and f3 are some sort of trial functions or polynomials. At least sometimes approximation is sufficient for the purpose. 1% accuracy should be enough and 10% often is ok. If functions do not fit well, best result for four variables that can be expressed f(x,y)=g(z,h)=X, as an example, is two grid nomographs. Construct two grids such that their x-coordinate (X) is the same. I spent some time to thinking how to construct a mortgage nomogram. Some books said it is impossible, but in d'Ocagnes (18989) book was a solution nomograph! [quote="Leif"]If I understand correctly, this is close to a term "rectification of curves" that is discussed e.g. in Ref. [p. 180, Levens, 2nd Ed, 1965]. The question is how one can make log(f(x))-log(g(y)) plots where all curves g(z)=const are straight lines. Sometimes this does not work out and result is that one does not try to find a intersection but a tangent as in Fig. 153 in Ref. above. That's a somewhat different thing - though a very important idea that I want to write a little about later, if I can re-find the book I originally read about it in. I am not certain if I saw Levens' book, but I did once see this idea, which if I am remembering correctly is to see whethere a function can be turned into a nomogram by dealing with the dual problem, and then using the dual graph to help set up the nomogram (you can use the dual to directly construct the nomogram, but it isn't always necessary to use that conversion). That's a correct, relatively formal approach. So you can look for straight - or almost straight - lines in the dual. I was describing a more direct seat of the pants approach which is basically that described in Davis' book on Empirical equations and Nomography, though I have extended/simplified what he describes in a number of ways in the above. It does not deal with the dual problem at all. What makes the approach above seat-of-the-pants (much more so than Davis, who requires the equation to be of a particular form) is you don't establish that the equation is nomographable at all - you simply assume that it is (and of a particular kind) - and then construct it by hand, since if it is nomogrammable in that form, the procedure works and if it is not, the procedure doesn't, and in an obvious way. You don't need to know anything about determinants, duals, or really, much more than a little basic algebra and basic drawing skills. In that sense, yes, there's a distinct similarity in aim, though the approach is different to what I was describing - you're fitting approximating functions to be nomogrammed, whereas the approach I was describing works with the original equation (possibly transformed), and constructs it purely geometrically. You may have no direct idea what the fitted function in the nomogram is. If functions do not fit well, best result for four variables that can be expressed f(x,y)=g(z,h)=X, as an example, is two grid nomographs. Construct two grids such that their x-coordinate (X) is the same. If instead you mean what I think you mean (sorry, I don't have a picture handy to point to right now), then this was the approach that was eventually used for the rocket problem. However, I never stopped trying to think of other ways to do it. It has some interesting features. I think I have a good solution now, though I know Winchell won't like it because it has two nomograms with a common scale. I spent some time to thinking how to construct a mortgage nomogram. Some books said it is impossible, but in d'Ocagnes (18989) book was a solution nomograph! amount borrowed, interest rate, term, monthly payment? If I am reading this right, the thing you're talking about here is, as I said before - once you achieve straight lines - the dual of the alignment nomogram. The original diagram (where the lines may be curved) is sometimes called a "concurrency nomogram" or an "intersection chart". Straightening the curves is sometimes called "anamorphosis" and there are approximate geometric constructions to do this by hand. It occurs to me that it seems possible to do this sort of anamorphic/rectification calculation automatically. I might see if I can get some time in a couple of weeks and write an algorithm. and fit polynomials to all six functions to match the real equation, one can get closest to a nomographic solution. Many algorithms in nomographic books were designed for nomographs done by hand. Here is the possibility for computers: generate good approximate nomographs easily and fast. amount borrowed, interest rate, term, monthly payment as you guessed. idea is to have two grids where x-value (or y, or... )on the paper is the same f(x,y)=g(z,h)=X. See [d'Ocagne, TraitÃ© de Nomographie,1899, pp.304-306]. This is something I have not seen (or understood) elsewhere. But that doesn't allow for the fact that you might get much closer after some transformation. and you want to approximate it by the above equation you wrote. That may not fit very well, but it may be that by converting the equation F(u,v,w)=0 into a different equation with the same zeros, you may be able to get a very good approximation. It's the search for a suitable transform to near nomogrammability that's the tricky part, in my opinion. I think we're both saying the same thing. If your interest rate is annual, it's a fraction more complicated, but not hugely so (and you can work it out from the monthly rate easily anyway). I have some nifty tricks that might be amenable to, so as to get it working on a more standard nomogram. What range of terms and interest rates were you looking at? For interest, I think it was 1% to 10% and 5 to 50 years. By polynomials I got somewhere of 4% maximum error if I recall right. It was anyway little too much. [quote="Leif"]For interest, I think it was 1% to 10% and 5 to 50 years. Of course transformation shouldn't change the equation - but it can change how easy it is to approximate. Well-chosen transformations can also improve the tick-mark intervals. In a test I did last night (on 4 to 25 years and rates 1.2% to >25%), the simple transformation-and-approximation I tried seems to be giving maximum errors on the order of 2.8% (though if I take out the couple of combinations with simultaneously the largest interest rates (>25%) and largest terms at the same time, I think I can get the maximum error to half that). I could probably get these numbers down with some work - this was just the first transformation I tried. Reducing the maximum interest rate to 10% would help a lot, but on the other hand, doubling the maximum term would make it worse. This was using a design with an N chart backed onto another N-chart with a curved diagonal (with the equations transformed to be in a fractional power of the principal and monthly payment). I have not yet constructed the nomogram, so the error from using the nomogram could add a little to that.